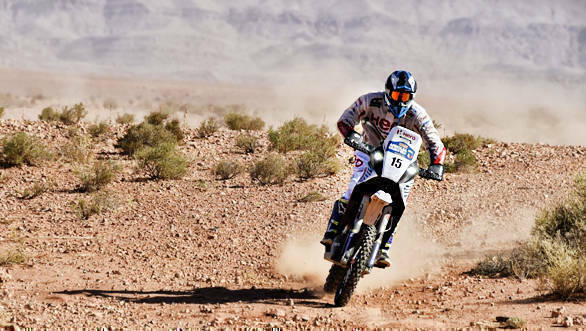 Hero MotoSports Team Rally riders Joaquim Rodrigues and CS Santosh have completed Stage 4 of the Afriquia Merzouga Rally 2016. After tackling a challenging Stage 3, the two riders heaved a sigh of relief as Stage 4 was relatively "tame". Rodrigues missed the top 10 this time round, but still holds a strong overall 9th position, while Santosh finished 23rd while standing 19th overall. "My first ever (two-day) marathon stage didn´t start that great. I got lost too many times on Wednesday and had a crash. My navigation device broke and that was really bad. Luckily I found a fellow rider and followed him to the bivouac. I managed to fix the bike and started today alright. I was trying to catch the riders in front of me and got a little lost. Still it was a pretty good ride, happy to have finished this new challenge. Tomorrow we will end the rally with a format that should suit me. I´ll give it my best one more time," said Rodrigues reflecting on his first marathon stage in the event. CS Santosh added to that, saying, "The organisers had told us it was going to be demanding and it was for sure. They cut things short because of the weather, which was the right decision. This morning I started well, but I made a mistake in the navigation. That cost me a lot of time. Overall I´m happy to be back at the main bivouac. The bike is fantastic, no problems at all. Now looking forward to the final stage." The fifth and final stage of the Merzouga rally will be held today and is a total of 74km in length. The stage will feature a Le Mans start, and will end at the town of Erfoud, marking the conclusion of a 1500km rally spanning six days.